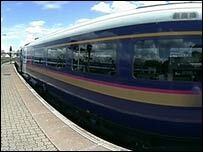 The government is insisting no decision has been made on the future of Cornwall's sleeper train. However, it has admitted it is considering bids from rail companies that might cut the service from Paddington to Penzance and Newquay. MPs from across Cornwall have been applying pressure on the government to save the service in a special adjournment debate. The government says that at the moment the service is not cost effective. In a special Commons debate on Wednesday, Julia Goldsworthy, the Liberal Democrat MP for Falmouth, led the calls. She said: "The service conjures up romantic emotions and the hopes of arriving in Cornwall refreshed - for this reason alone it should be supported." Transport minister Derek Twigg agreed to meet the MPs before any final decision was made but argued that - at the moment - the service was not cost effective. An announcement by the Strategic Rail Authority (SRA) had first raised fears that the overnight London service could be axed anytime after next April. The SRA has asked the three main companies bidding for the new "Greater Western" rail franchise to cost the service separately from the rest of their bids - indicating that it could be cut entirely. There has been an outcry from local business people who use the overnight rail link, and Ms Goldsworthy said that she herself was a regular passenger on the service.